We were glad that the weather greeted us so fairly at Woodland Hills, where our hotel was located when we arrived 10-March, 2008. 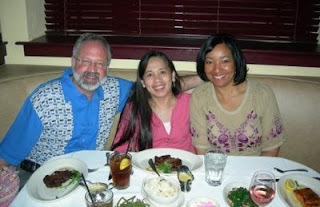 We then spent the rest of our time for dinner at Morton Steak House, just a block away from our hotel with our friend Janell. As usual, I had my favorite menu - fillet mignon, well done, with a side of garlic green beans. 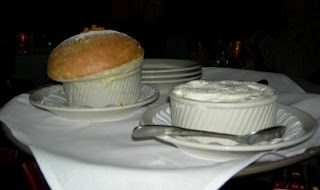 LOL, afterwhich we were treated to a very yummy dessert - a specialty of Morton's! I forgot the name of this one, but it was really super tasty! Anyway, this was our first day. We had lots of enough time to take a rest the rest of the day. Well, after that heavy dinner, our sleep was sooooo good! :).